E-commerce retailers and businesses offering apparel, shoes, outdoor equipment, arts & craft supplies, or even furniture use SpeedCell Storage Solutions to improve storage and order picking operations. The unique, patented design of SpeedCell offers high density storage for slow to medium-speed items within crowded warehouses, helping to increase storage capabilities up to 60 percent. One furniture, bedding and home goods retailer uses our SpeedCell solution to hold everything from linens to kitchenware to furniture components. Instead of storing open, full cases, items are removed from boxes and stored per SKU in SpeedCell, keeping the warehouse clean and orderly. The company’s WMS directs order pickers to the proper location, whether in the SpeedCell area or in the full case area. • SpeedCell provides high density, scalable storage that uses every inch of potential storage space within your pallet racks. • SpeedCell columns come in a variety of sizes, with standardized cells of (sizes). Customized columns and cells are also available. • SpeedCell Storage Solutions are made from high-strength industrial textiles that are fire, flame, mold and static resistant. Each cell holds up to 35 pounds; each column holds up to 240 pounds. • SpeedCell cuts labor costs by 40% on average with less travel and greater efficiencies. • ROI of typically less than 1 year. One arts & craft retailer ran out of space in the DC and couldn’t add more room in the building because they were landlocked. Buying a new building was too costly. Instead the retailer put SpeedCell within their DC and now holds 77% of their SKUs in 17% of the building. Initially the retailer installed 4 bays and found it would hold 20 bays of products. The firm uses SpeedCell to house open boxes for e-commerce orders, which equates to thousands and thousands of SKUs. Besides dense storage, SpeedCell improves picking efficiencies. Columns can move left or right in racks, allowing order pickers access to rows behind. As a result, order pickers speed their order picking rates because they don’t have to walk around. They just step next to a column, push it aside to reach the one in the back and select the correct SKU. No longer do workers have to travel up and down rows to fill orders. 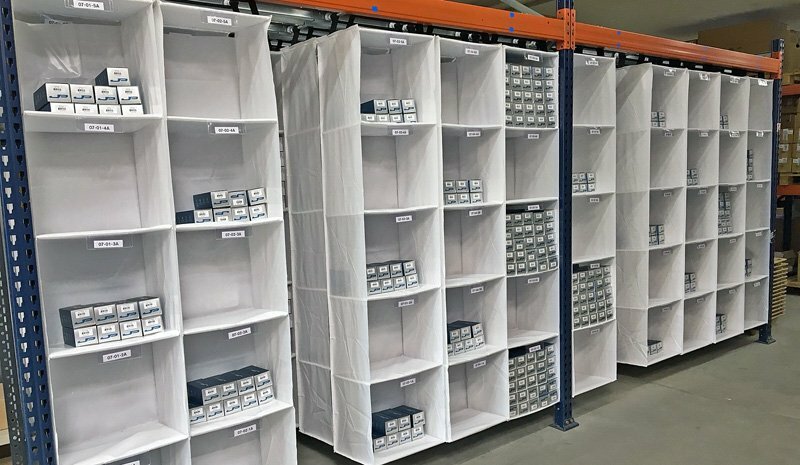 UNEX SpeedCartt uses SpeedCell columns installed in a wire cart to improve the picking of orders or restocking of shelves or cells. SpeedCartt was introduced after SpeedCell’s engineers watched how several companies were picking orders from cut-out cardboard boxes set in racks. The pickers used shopping carts to sort orders as they walked up and down aisles to gather items to fulfill orders. Often orders would get mixed up in the shopping carts. With the SpeedCartt, which offers up to 50 cell locations per cart, order pickers have better order accuracy and restocking is much easier. If you need greater efficiency and productivity in your order picking of slow to medium-speed products, want to cut labor costs by 40% on average or decrease travel in your warehouse, then look at SpeedCell from UNEX Manufacturing.